For the book, see The Color of Money (novel). This article is about the film. For other uses, see The Color of Money (disambiguation). The Color of Money is a 1986 American drama film directed by Martin Scorsese from a screenplay by Richard Price, based on the 1984 novel of the same name by Walter Tevis. The film stars Paul Newman and Tom Cruise, with Mary Elizabeth Mastrantonio, Helen Shaver, and John Turturro in supporting roles. The film featured an original score by Robbie Robertson. The film continues the story of pool hustler and stakehorse Edward "Fast Eddie" Felson from Tevis' first novel, The Hustler (1959), with Newman reprising his role from the 1961 film adaptation. The film begins more than 25 years after the events of the previous film, with Eddie retired from the pool circuit. Although Tevis did author a screenplay for the film, adapting the storyline from his novel, the filmmakers decided not to use it, instead crafting an entirely different story under Tevis' title. 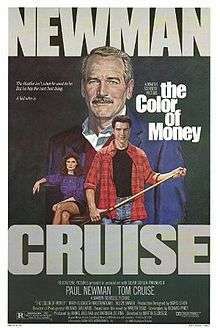 The Color of Money was released by Touchstone Pictures. Eddie Felson (Paul Newman) is a former pool hustler turned successful liquor salesman. One night he meets Vincent Lauria (Tom Cruise), a young, charismatic pool player and video gamer who plays small-time nine-ball games while working as a sales clerk at a toy store. Eddie, who still stakes bets for talented players like Julian (John Turturro), persuades Vincent and girlfriend/manager Carmen (Mary Elizabeth Mastrantonio) to go on the road, where he can teach Vincent how to make much more money through hustling pool. With Eddie staking their bets, Vincent visits a series of billiard halls where Eddie tries to teach him that "pool excellence is not about excellent pool." Although Carmen is a quick study, Vincent chafes at Eddie's scams, which routinely require him to play well below his abilities. Eventually, Fast Eddie picks up a cue himself, and does well in several games, but is taken in by a pool shark named Amos (Forest Whitaker). Humiliated, Eddie leaves Vincent and Carmen with enough money to make it to the championships in Atlantic City. Wearing new prescription eyeglasses, Eddie begins working out and practicing. He enters the 9-ball tournament in Atlantic City and, after several victories, finds himself facing off against a more world-wise Vincent. He beats Vincent, but later, when he is celebrating with girlfriend Janelle (Helen Shaver), Vincent arrives and informs Eddie that he intentionally lost in order to collect on a bet. He gives Eddie $8,000 as his "cut." During his semi-final match against Kennedy, Eddie sees his reflection in the cue ball; disgruntled, he chooses to forfeit the game. Out-hustled again, Eddie returns the money, saying that he wants to beat Vincent legitimately. The two set up a private match, where Eddie informs Vincent that if he doesn't beat him now, he will in the future because "I'm back!" Many top American pool players of the 1980s had speaking roles, including Steve Mizerak, Grady Mathews, and Keith McCready, and there were many cameo appearances, including Jimmy Mataya, Mark Jarvis, Howard Vickery and Louie Roberts. Director Scorsese has a cameo walking his dog, and another playing pool. Another notable cameo is that of Iggy Pop, who plays one of the many contenders on the road. Screenwriter Richard Price also has a cameo as a bar fly in the pool hall where Eddie plays Amos. Scorsese has cited the influence of techniques and lighting in the 1947 Powell-Pressburger classic Black Narcissus in making the film. In particular he states that the extreme close ups of Tom Cruise around the pool table were inspired by those of the nuns in that film. Newman said that the best advice he was given by Scorsese was to "try not to be funny". Cruise performed most of his own shots. An exception was a jump shot over two balls to sink another. Scorsese believed Cruise could learn the shot, but that it would take too long, so the shot was performed for him by Mike Sigel. Cruise mentioned, to prepare for the role, he bought a pool table for his apartment and practiced for hours on end. Standing in for the extremely valuable "Balabushka" cue in the movie was actually a Joss J-18 (which later became the Joss 10-N7), made to resemble a classic Balabushka. Mike Sigel was technical director, and he and Ewa Mataya Laurance served as technical consultants and shot-performers on the film. Absent from the film is the character Minnesota Fats, played by Jackie Gleason in The Hustler. Newman later said that he had wanted the character to appear, but that none of the attempts to include him fit well into the story that was being written. According to Scorsese, Gleason apparently agreed with Newman's opinion that Minnesota Fats was not essential to the film's story. Scorsese said that Gleason was presented a draft of the script that had Fats worked into the narrative, but that upon reading it, Gleason declined to reprise the role because he felt that the character seemed to have been added as "an afterthought". Nine-Ball is rotation pool, the balls are pocketed in numbered order. The only ball that means anything, that wins it, is the 9. Now, the player can shoot eight trick shots in a row, blow the 9, and lose. On the other hand, the player can get the 9 in on the break, if the balls spread right, and win. Which is to say, that luck plays a part in nine-ball. But for some players, luck itself is an art. The soundtrack to the motion picture was released by MCA Records in 1986. The Color of Money held its world premiere at the Ziegfeld Theater in New York City, NY on October 8, 1986. The film was commercially released in the United States on October 17, 1986. This release was limited to only select theaters throughout the country, with the film opening in more theaters during the next four weeks of its initial release. After its run, the film grossed $52,293,982 domestically. The film received positive critical response upon its release, though many critics noted that the film was an inferior followup to The Hustler. Based on 39 reviews collected by Rotten Tomatoes, the film received a 90% approval rating from critics, with an average score of 7.3/10. Siskel and Ebert gave the film "two thumbs down", Scorsese's only film to receive such a review from the team. The film positively influenced the popularity of pool. Ben Stiller, then a film student at NYU and a cast-member of the Broadway production of The House of Blue Leaves, created a student film, The Hustler of Money, that parodied the movie. It featured Stiller's Broadway co-stars John Mahoney, Danny Aiello and Julie Hagerty, with appearances by his parents. The film appeared on an episode of SNL. Newman received the award for Best Actor in 1986 from the U.S. National Board of Review of Motion Pictures. The Color of Money was first released onto DVD on June 4, 2002. The film was later released on Blu-ray on June 5, 2012. Neither of the releases contain any special features pertaining to the film itself. A 1996 nine-ball challenge match between Efren Reyes and Earl Strickland was named after the film. ↑ LoBrutto, Vincent (November 30, 2007). Martin Scorsese: A Biography. Westport, Connecticut: Praeger Publishers. ISBN 978-0-275-98705-3. 1 2 Forsberg, Myra (October 19, 1986). "'The Color of Money': Three Men and a Sequel". The New York Times. ↑ "Black Narcissus (The Criterion Collection) (2001) DVD commentary". Criterion. Retrieved 27 October 2013. ↑ Levy, Shawn (May 5, 2009). Paul Newman: A Life. New York: Harmony Books. ISBN 978-0-307-35375-7. ↑ The catalogue number for the original CD release was DMCG 6023. The soundtrack information was taken from the CD booklet. ↑ "The Color of Money (1986)". Box Office Mojo. Retrieved September 13, 2012. ↑ "The Color of Money". Rotten Tomatoes. Retrieved September 13, 2012. ↑ "Most Significant Event: The Color of Money (1986)", Billiards Digest, October 2003, page 72. ↑ "The 59th Academy Awards (1986) Nominees and Winners". Academy of Motion Picture Arts and Sciences. Retrieved 2014-03-15. ↑ "1986 Award Winners". National Board of Review of Motion Pictures. 2016. Retrieved October 31, 2016. ↑ "AFI's Top 10 Sports Nominees". Retrieved 2016-08-14. ↑ "'The Color of Money' Announced for Blu-ray". Retrieved 2012-06-11. ↑ Reuben, Michael (June 6, 2012). "The Color of Money Blu-ray Review: We've Been Hustled". Blu-ray.com. Retrieved September 14, 2012. ↑ "'Bata' Reyes, Strickland in $100,000 duel". Manila Standard Today. November 27, 1996. p. 15. Available editions of the book include: ISBN 0-446-32353-5 (1984, first edition), ISBN 0-446-34419-2 (1986, movie tie-in edition), ISBN 0-349-10150-7 (1990), ISBN 1-56849-689-3 (1997), and ISBN 1-56025-485-8 (2003).